The time is right for Burkina Faso to develop seed systems for vegetables, introduce good agricultural practices to reduce reliance on chemical pesticides, and take a total value chain perspective for vegetable production. On 2 October 2018 in Ouagadougou, a WorldVeg team met with the Honorable Prof. Alkassoum Maïga, Minister of Higher Education, Scientific Research and Innovation, to explore opportunities for collaboration in the country. 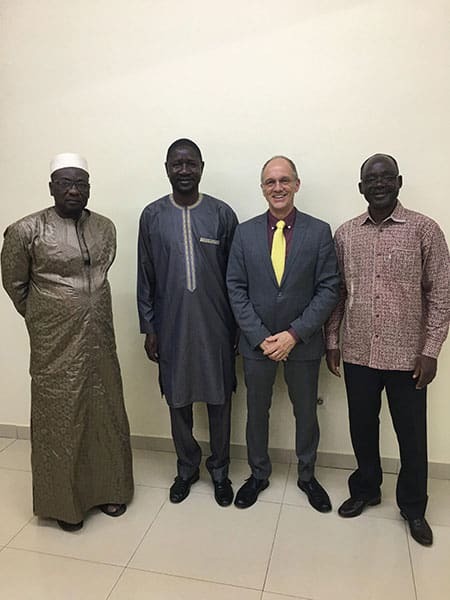 (left to right) Kabirou Ndiaye, Regional Director, WorldVeg West and Central Africa – Dry Regions; the Honorable Prof. Alkassoum Maïga, Minister of Higher Education, Scientific Research and Innovation, Burkina Faso; Marco Wopereis, WorldVeg Director General; and Dr. Koussao Somé, selectionneur / plant breeder, Institut de l’Environnement et de Recherches Agricoles (INERA).